Philadelphia police arrested three anti-Trump protesters Sunday afternoon when fisticuffs erupted outside a bar after two rival city-permitted rallies — a 150-person "impeach Trump" event and a 50-person pro-Trump counter-march — completed their routes peacefully. Officers said "a group of pro-POTUS [President of the United States] persons" trying to enter the bar at 16th and Cuthbert Streets was confronted by "a group of anti-POTUS persons and an altercation ensued." A pro-Trump demonstrator and a police officer were assaulted, according to Officer Tanya Little, a police spokeswoman. Two anti-Trump people were charged with assaulting the pro-Trump marcher in front of numerous police officers. The man suffered a minor mouth injury, Little said. A photograph showed one victim's bare chest and beige shorts covered with blood. Another shows that the police handcuffed two men dressed in black shirts and pants. A third Trump opponent was charged with assaulting the police officer, and a fourth person was issued a citation, Little said. The city-permitted impeachment march and rally, like the smaller pro-Trump rally, were peaceful. But the pro-Trump march had been stalked by a separate group of up to 40 black-garbed anti-Trump protesters who repeatedly sought to confront the Trump supporters, police said. A large contingent of Philadelphia police officers lined the march routes and guarded rally sites on foot, in cars, on bicycles, and in a helicopter. The officers were backed by officers from the National Park Service, Homeland Security, and SEPTA and Philadelphia County Sheriff's Office deputies. The local impeachment demonstration, along with similar events in New York, Los Angeles, and other cities, was called to encourage Republicans in Congress to join Democrats in voting to oust the nation's top elected official. After the rallies, pro-Trump demonstration organizer Zachary Rehl said he and 10 fellow marchers — some carrying pro-Trump banners and signs — headed south from Logan Circle "to get a beer" at Tir na nOg, an Irish-themed bar at 16th Street south of Arch. Rehl, a Marine Corps veteran and Temple University student, said: "The Antifa found us" outside the bar and a group of "six or seven" black-clad protesters started shouting insults at the Trump supporters. "Antifa" is a term adopted by militant "anti-fascist" protesters who in the U.S. seek to confront Trump supporters, operating independently of legally permitted protests. The police haven't confirmed any affiliation for the people they arrested other than their opposition to the President. According to Rehl, the antagonists who targeted his group included two women and four or five men. "Three of them punched us," and were detained by police, along with a pro-Trump protester who Rehl said had been hit. After police broke up the scuffle, the Trump supporters posted videos of police pinning protesters to the sidewalk on their Facebook site, Sports Beer & Politics, then went into the bar and had their beers, Rehl said. Pro-Trump demonstrator Ellsworth George Lewis III later posed at the bar with an Antifa flag, a satiny black, red and white banner bearing the German-language slogan, "Antifascist Action." "I got it from a police officer," he said later. "He was going to trash it, but I asked him if I could keep it and he obliged." Lewis added that he sustained "a split lip and a bruise" in the scuffle, while another Trump supporter was bloodied by a bottle, but "managed to chase" the attackers downstairs into neighboring Suburban Station, the Septa train and subway complex, where they were detained by police. Later, management at Tir na nOg commented on the incident: "We will not tolerate hate of any kind," adding that "the people involved in the incident were asked to leave." A group calling itself the Philadelphia Anti-Repression Fund mobilized on FundRazr.com to support those arrested, who were not immediately named by police or supporters. "All funds will go directly to bail and legal fees for arrestees," fund organizers posted. "Any additional funds will go to the PHL Anti-Repression fund to support future arrests. Please help our friends taking action against white supremacy and fascism!" The fund raised more than $1,000 from more than two dozen contributors in the hours after the arrests. The strong police presence in Center City briefly trapped tourists, including Joe Maduro of Freeland, Pa., at their hotels until vehicles trailing the marchers passed and streets reopened. Back at the city-permitted rally, Trevor Muth, one of several members of a central Montgomery County-based chapter of Indivisible who attended in sky-blue T-shirts advertising their group, said members regularly attends peaceful protests. He said they have been recruiting candidates for state and local offices who support Planned Parenthood, gun control, and other causes he said are threatened by Trump positions. Beth Goldstein, a mathematics teacher and South Philadelphia resident, said she joined the impeachment protest to advocate for "a more tolerant, more open, more egalitarian society" than she sees developing under Trump. Kyohn Page and James Small, Philadelphia natives and recent Bloomsburg University graduates, joined the impeachment rally "to show the youth we can be politically active," Small said. "We saw it on Facebook," said Olivia Martinez, a rising freshman at Rutgers University, who came with friends who shared her concerns over reports of Trump's ties to Russia and his family business interests. Barbara Johnson, a retired Philadelphia teacher in a Mennonite Relief T-shrit, said she joined the impeachment march to support a campaign to expand Medicare to cover all Americans. Her friend Diane Mitrione, a pharma company consultant, said she wanted to bring attention to what she said were Trump's violation of the Constitutional ban on personal "emoluments" to elected officials who enrich themselves through office, to Turmp's "collusion" with the Russian government, and his "obstruction of justice" in law enforcement reviews of his administration's conduct. Mitrione said she was active in her South Jersey chapter of Indivisible. Kathleen Moyer of Philadelphia said she joined the impeachment rally after reading accounts that concerned her over Trump's dedication to democracy. "He seems really unhinged," said her brother Patrick, who said Trump owes his election victory to the way many Americans are "fed up with politics and lies." But he's concerned Trump won't improve matters. He's hoping other Republicans will get disgusted and say "This is enough." "Trump is so bad for this country," said Beth Mulhern, a Northeast Philadelphia accountant. "I'm concerned about civil liberties. He's out for profit and privatization" of public services, she said. In recent days, both sides used the specter of conflict to rally loyalists on social media. Police Chief Inspector Melvin Singleton said there were activists who refused to join the permitted groups, and his force rolled aside marchers to prevent confrontations. 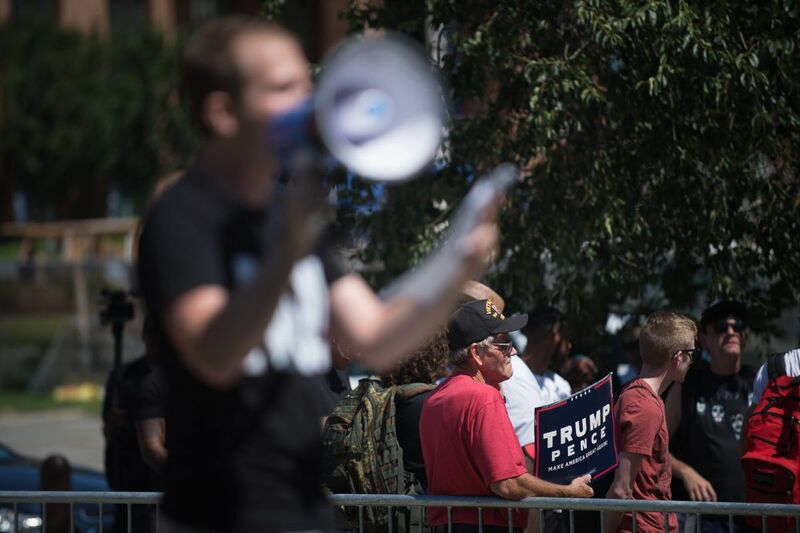 As the pro-Trump group prepared to march down Walnut Street and up to Logan Circle, a group of up to 40 black-garbed anti-Trump protesters gathered to oppose them, but were warned off by officers shadowing them. Some walked to Reading Terminal, took off their black garb, and faded into the civilian crowd, according to police. Liberals calling for Trump's ouster also claimed to face possible attack. "The police are extremely prepared, mostly because of the Proud Boys," said impeachment Trump rally organizer David Love of Philadelphia. He described Proud Boys as a rightist group that backs Trump. "I never heard of Proud Boys," said Rehl as he welcomed demonstrators to the march kick-off site, the Irish Famine memorial above I-95. "I'm a Proud Boy," said pro-Trump marcher Justin Brown. "It's a loose organization in its infancy. It's right-wing, and anti-left, but it has nothing to do with white supremacy. It's guys having fun." He said he'd been part of a Proud Boys "free-speech" rally in Washington recently after U.S. Rep.Steve Scalise, R-La., was shot by an angry liberal activist. In case of anti-Trump violence Sunday, Trump supporter Dakota Lutz, a York County factory worker, pointed to his hip, where he'd packed a camouflage bag that held a medical kit. He didn't need it, though the muggy summer day had Trump supporters handing out Pepsis to marchers and spectators — purchased outside the city where Philadelphia's sweet-drinks tax doesn't apply, two activists noted proudly. Howard Caplan, a Northeast Philadelphia resident who held up a large pro-Trump sign at the impeachment rally, said he "saw no evidence of any collusion with Russia" but was very concerned that Democrats were shielding child molesters. He said he didn't trust news media and got most of his information "on social media." "I feel sorry for this man," said impeachment organizer David Love, pointing to Caplan, "but I'm not worried about him. He is standing on the wrong side of history." In the pro-Trump camp, an Asian-American who called himself Pill Eater — he uses the term on social media but declined to confirm his legal name — was given time on the agenda to talk about "Asian-Arianism, an ideology brand that I made up" to "promote a balance" among technologically-savvy groups. "The Trump movement attracts people who are tired of the politically correct climate," he said, adding that this makes it "more entertaining" than the anti-Trump camp. A lone pro-Trump marcher who wore a Confederate flag declined to give his name. He was outnumbered by several carrying green flags marked with crosses, like the flags of the Nordic countries of northern Europe, superimposed with four letter Ks facing outward in a circle, and a circle of hearts. Critics have pointed out the flag is patterned on the flag of the Nazi navy under Adolf Hitler. Jeff Thomas, the Ursinus College graduate (he majored in theater) who brought the flags, said they stand for "Kekistan," a satirical belief system rooted in gamer culture that is shared like a social-media meme by younger Trump supporters. Thomas led a "Kekistan prayer" to end the pro-Trump rally: "Thy Trump done come, Thy will be done… Forgive us our baitings, as we forgive those who bait against us."